Part 5: Posted 8/01/2013. Click here for the full sized original post. It’s now over 7 weeks since I set up ‘The Reactor’, an external compost bed designed to heat the ‘inner zone’ in our 14 X 8 foot cedar framed greenhouse. Thanks again to Fiona’s patience and wizardry with Excel, I’m posting below 2 more graphs by way of an update on its performance. Temperatures are in degrees C.
…. (The inner zone max./min. readings in the lower graph are omitted from the top graph for clarity. The inner zone max./min. 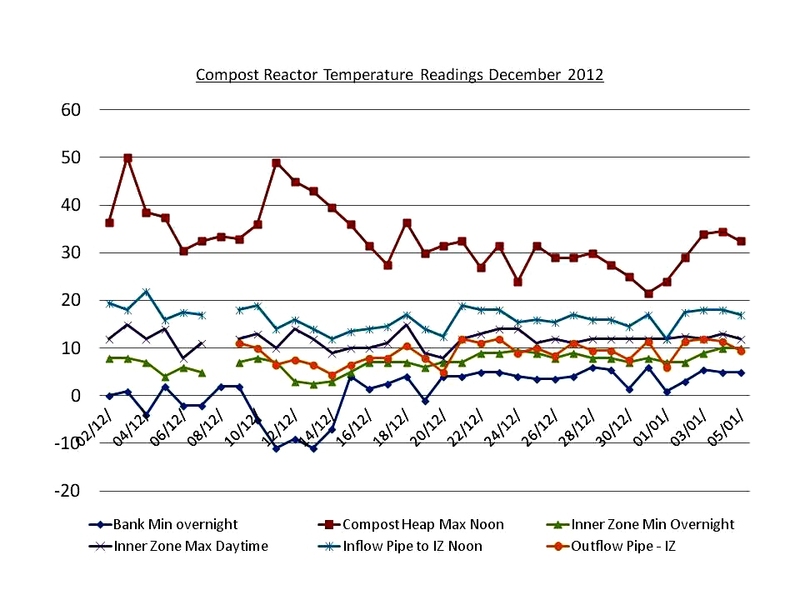 temperature readings are taken at the opposite end of the inner zone to the compost heap, and its associated warm air inflow. So the lower temperatures recorded in this different location reflect the inevitable subtle temperature variations within any finite elongated space like this. The additions at Point D were for time and illness reasons a simple top up, with no changing of the contents of the inner core tubs of material)…. Given the usual caveats about missing data – since we’re not always around; and lack of statistical significance, a few more observations are merited. (I do have even more temperature readings, but it’s just too cluttered to add them to the above graphs). It seems a remarkably stable system, thus far, when run in the way that I selected, i.e. with simple weekly top ups of compostable material. 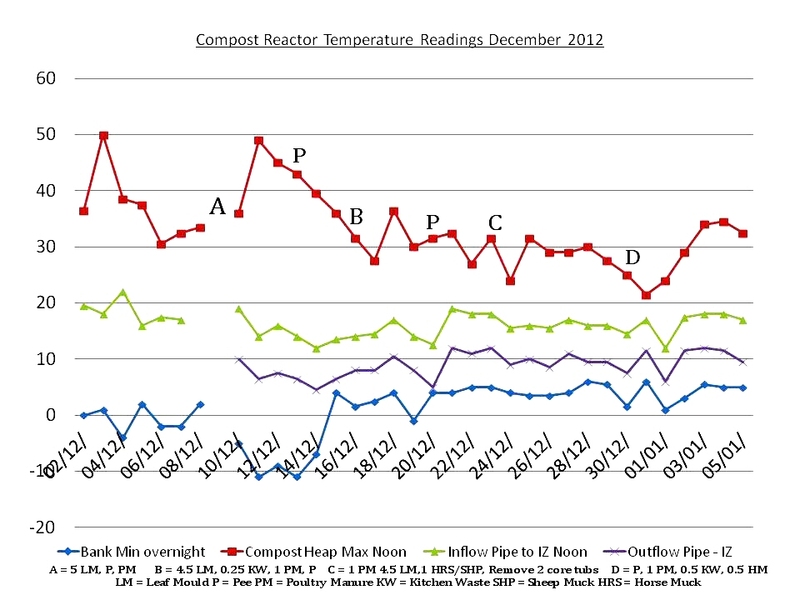 Regardless of external factors, the air seems to consistently gain about 7 degrees C after being passed through ‘The Reactor’/Compost Heap, regardless of external conditions. The inner zone structure itself consistently adds a further 2 to 3 degrees C benefit. This heat input seems to equate to roughly 0.39 KW of power per hour, 24 hours a day. (Actually not quite 24 hours per day, since I give the 20 watt fan driving the air flow a few short breaks through every 24 hours – This figure being calculated usingThe Hartley Botanic Greenhouse site for energy required to heat a similar volume structure by 7 degrees C.) Over the time of its operation so far, i.e. 7 weeks, is this worthwhile? 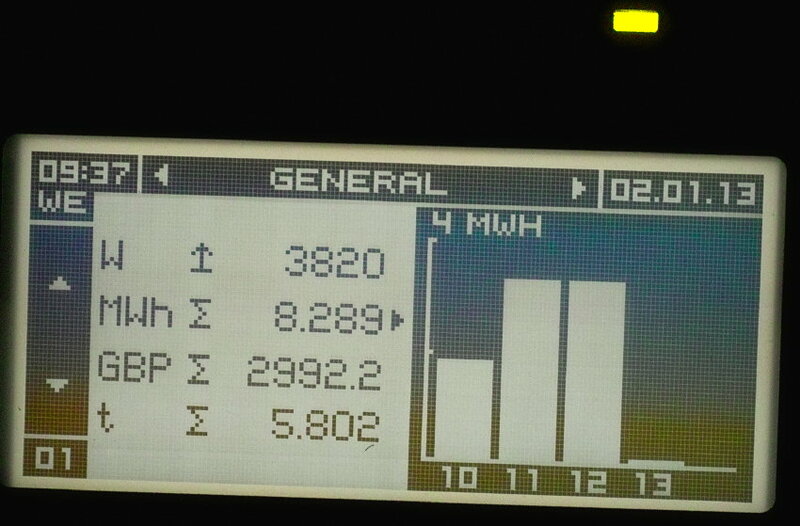 Well 0.39 X 24 X 7 X 7 = 458 KW hours. At say 15 p per KW hour, this equates to about £68. Over an anticipated 16 week winter period of operation, about £153. So not bad. Even if any of my assumptions, maths and physics are a bit flawed. The downside to the stability of the system of course is that there is little scope for a rapid boost if very cold temperatures were predicted. Although adding an extra top up of material, particularly nitrogenous material, would likely raise temperatures a little within 48 hours. My perimeter water bottles do seem to help stabilise temperatures when sub zero outside, and additional ‘hot water bottles’ could easily be added as a short term fix for really cold nights. The last 2 weekly top ups have required less leaf material to be added to maintain a roughly constant heap/bed height. But I’ve maintained the original quantity of nitrogenous material on all occasions (mainly poultry coop manure, with a little horse/sheep manure to make up quantities). In addition more circulation of material has been undertaken recently as heap temperatures have trended gently down – just a bit of forking or spading of the upper surface of the bed, and on one occasion so far, also digging out the material closest to the pipe on one side of ‘The Reactor’ down to a depth of about 0.4 metres, so adding extra aeration, and allowing ‘fresher’ material to come in contact with the outer pipe wall. But how much material has gone into the heap over these 7 weeks, and been ‘burned up’ by the composting process? The tally isroughly : 30.5 tubs of shredded leaf material, including perhaps 3 tubs equivalent of kitchen vegetable material; 6.5 tubs of poultry coop manure, including paper and hay; 1 tub of shredded cardboard – I stopped using this once it became clear I would have sufficient leaf material; and about 1. 25 tubs of mixed sheep and horse droppings – once the quantity of poultry manure dipped a little after Christmas….. This equates to roughly 276 kg mixed organic matter added to the already full heap created on Day one of the previous graph (19/12/2012). No significant quantity of material has fallen from the base at all yet, and the height of the heap has barely changed after all this time. 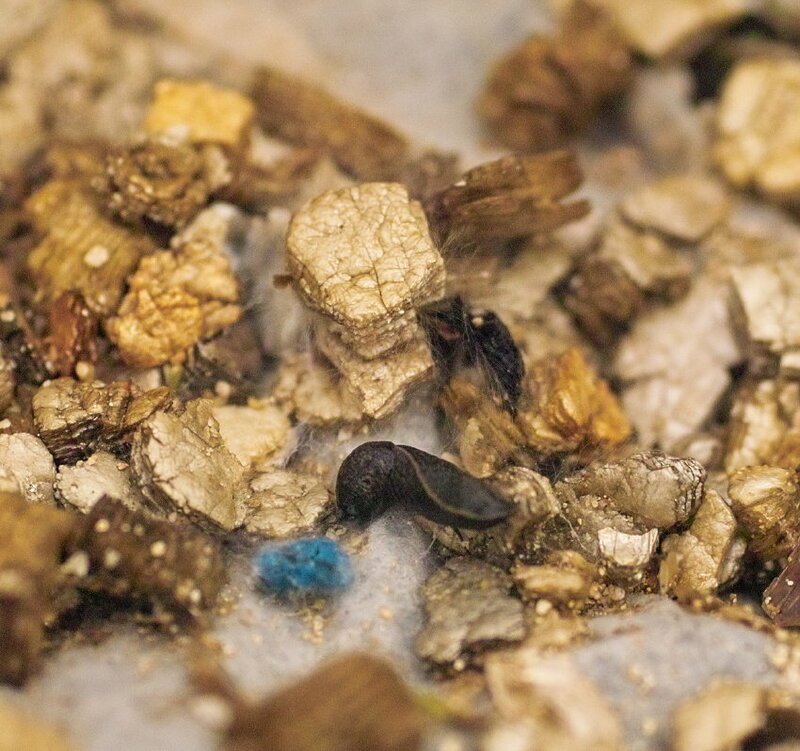 So this mass must reflect the quantity consumed during the aerobic composting reaction processes, allowing a bit for settlement of course, in much the same way that burned wood reduces in mass and volume dramatically during burning, as it turns to ash. In addition a 7 week total of roughly 70 litres of urine will have been added to the bed during twice weekly waterings. 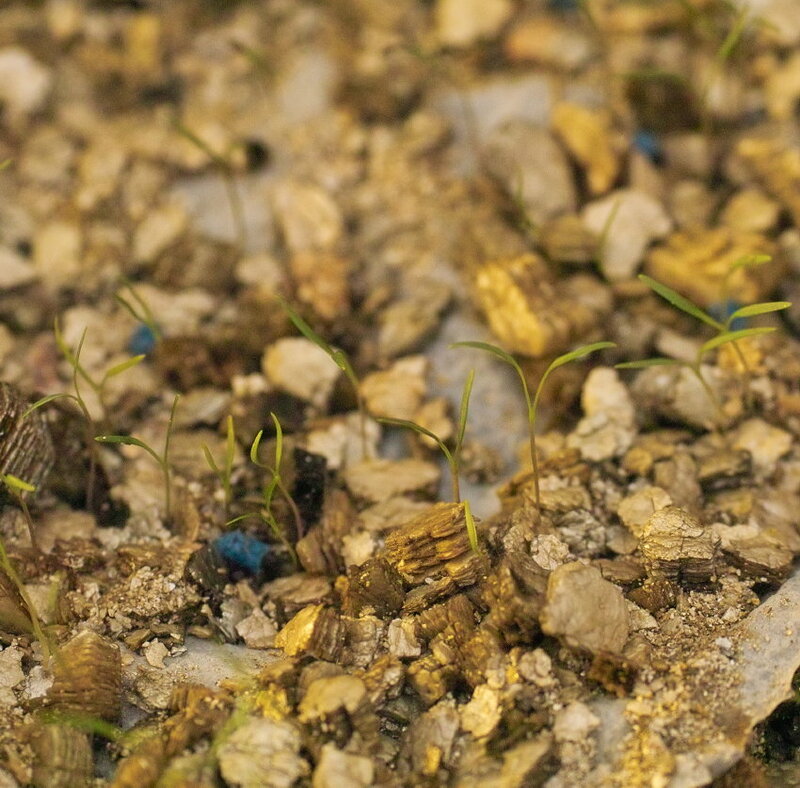 The material in the bed certainly visibly changes between top ups – within a week or so kitchen waste becomes less obviously identifiable, and the eventual compost will be of higher quality than that generated in our original heaps where material wasn’t shredded before inclusion or the nitrogen/carbon ratio so controlled. My suspicion is that a different pipe material, or its location within the heap, or stronger fan could indeed extract more usable heat without detracting from the composting process, and result in a consistently different graph, with even more of a beneficial temperature gain within the inner zone. 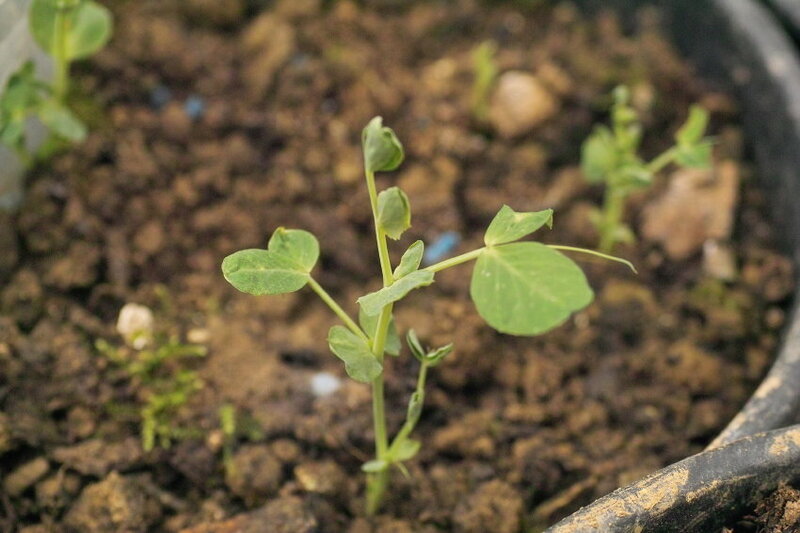 its early and trial nature, I reckon Mange tout peas (Oregon Sugar Pod) look promising, as do forced carrots (Early Nantes). 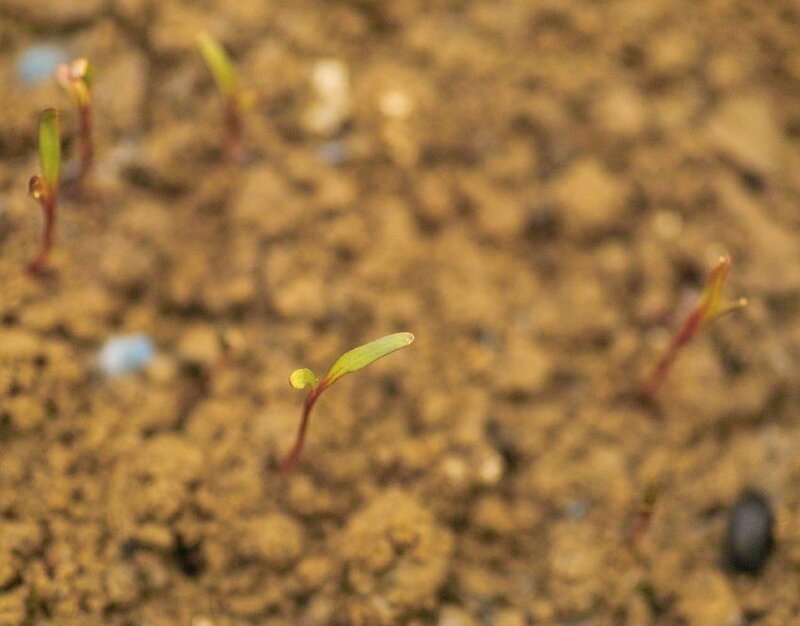 The lemons are looking very healthy, but the beetroot(Boltardy) have grown very slowly. 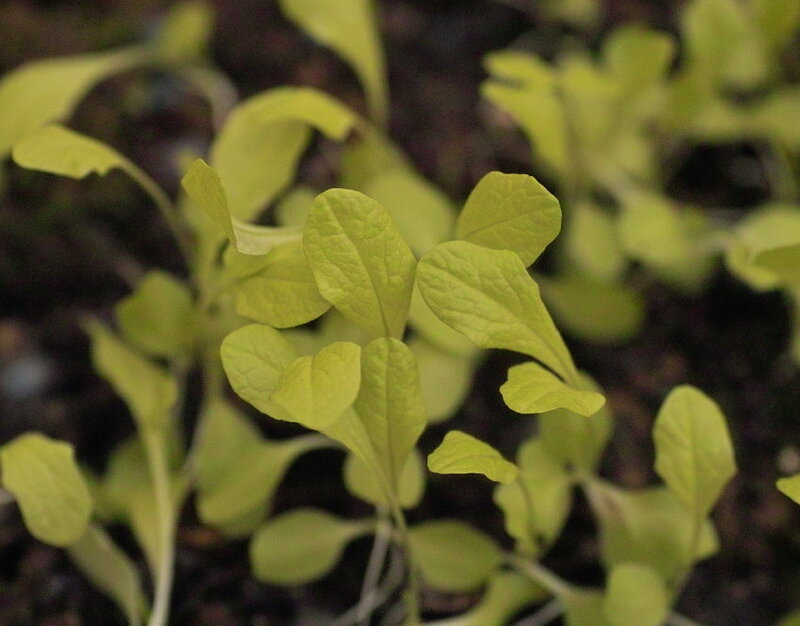 Yellow Pak Choi is also successful. 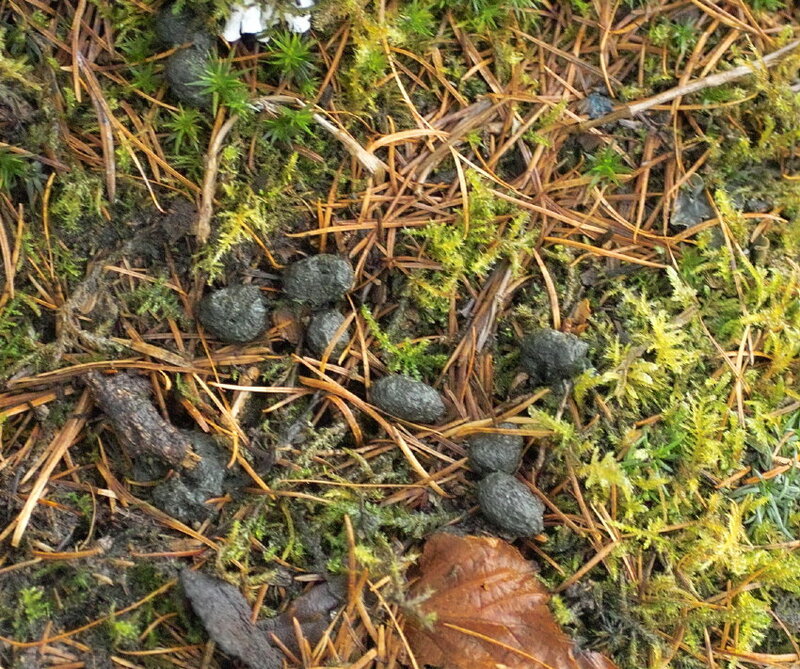 But slugs are a surprisingly big issue, even at this time of the year. My first batch of carrot seedlings were wiped out overnight, and one of my 12 inch pots had 3 small dead slugs in today after re baiting. So clearly the molluscs are appreciating the unseasonably mild conditions I’ve created! One unintended consequence of having set up ‘The Reactor’ with its thirst for nitrogenous material is that there now appears to be a supply shortage of liquid supplements. Apart from its obvious value as a nitrogen source, for several months before the greenhouse compost bed was made, I’ve been using it discretely (in both meanings of the word) as a rabbit, rodent and fox deterrent. And sorry, ladies, but it apparently needs to be male urine to be effective. WHAT! I hear you cry. In mitigation, and indeed support, of what had been a limited trial of dribbling from the much valued dedicated inherited galvanised Pee watering can around the property and poultry’s perimeter fencing ( that’s a nice bit of onomatopoeia), I offer the following fascinating information …. 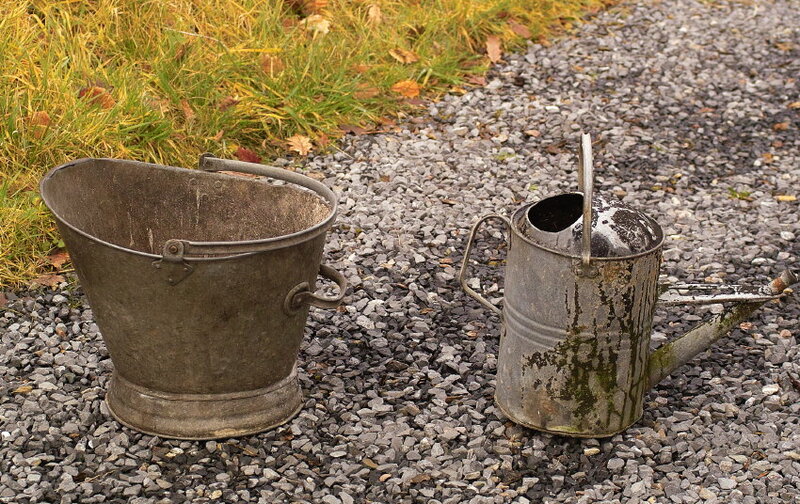 … (the metal ‘ash can’ which we also inherited with the house turned out to have been a pee pot for the household. We use it for wood/ash, and there’s an interesting recorded use of pee and wood ash being used historically as a cleansing house soap. This has yet to be personally verified)…..
Firstly the excellent site of www.thepeemart.com, which sells a huge range of animals’ scents and urine to knowledgeable folk in North America to deter, or attract, (if you’re a hunter) your particular friend or foe beast. Secondly, the consequences of letting up on its use around the property, once the greenhouse compost bed took priority. 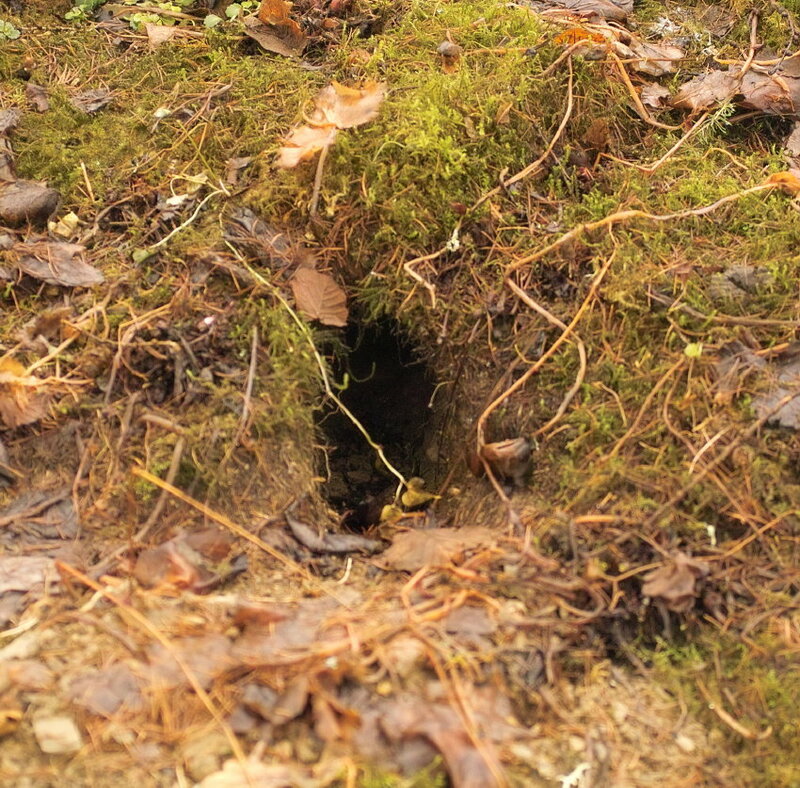 Where rabbits are concerned its regular application does seem to limit damage, and any gap in application or relentless rain sees the return of both scrapes and pellets…..
With foxes, like all security measures, you only discover that they’re inadequate after the event. 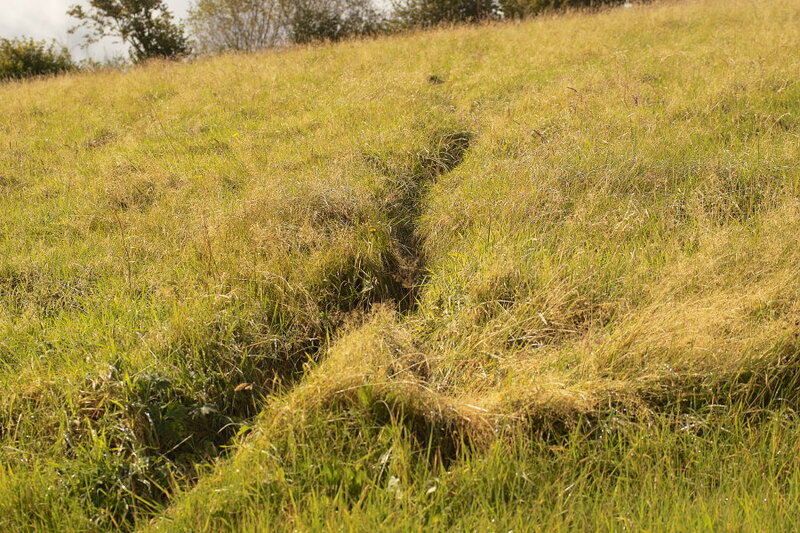 But there’s certainly lots of evidence of fox activity in the field above the poultry, with tracks heading towards the enclosure but as yet no attempts to breach the pee marked fence. There’s a little anecdotal evidence on line from other gardeners using it in this way. Click here. But perhaps the potential value of human urine use is overdue for a wider renaissance. Click here, here and here for much more on how it’s been utilised as a commodity over centuries. I particularly liked the stories surrounding its use in gunpowder manufacture. Apparently the American War Of Independence nearly failed for a shortage of gunpowder. Read a fascinating account here. The French came to the rescue of the Americans with ample supplies having previously ramped up their own poor manufacturing systems. And finally and most recently, Sweden has appreciated urine’s merits to the extent that municipally organized urine collection from modified WCs has been trialled in a number of locations over the previous 15 years. Click here and here. The problem to date has been providing simple and cost effective links between this municipal collection, and potential end user – usually farmers. So maybe using human pee in upland Wales really isn’t so radical, or wacky after all? (Feel free to respond…….). A perceived issue of course with its use around a property is that of odour. Fortunately I’d told a friend about both our amusing uses for it and the watering can, before she dropped her horse off for a few days of grazing in one of our meadows. She’s brought along her own water buckets, but finding us not at home when she’d arrived, and the outside taps drained down for the winter, looked around for a convenient water source. She was about to resort to the filled metal can behind the house when she paused………….. Inhaled………… And Remembered. But on the ground in small amounts any smell from the initially sterile fluid quickly dissipates. And as well as just dissipating, the rain soon washes it away. And what a year for rain. The totals have now been summed and our figure of 2081 mm, or over 83 inches for the year is certainly impressive. More than enough to drown me in one go, if I stood still for too long. For the UK as a whole, The Met Office has it down as the second wettest year ever since records began in the 1700′s. But the UK average rainfall figure in this wettest year is a mere 1330 mm by comparison. For all their comparative statistics click here. Not surprisingly the year’s PV output is down. But not by as much as I’d have thought. Its difficult to do an accurate comparison since over the last year a few trees which caused temporary shading on the panels have come down, and so the actual year’s results are almost identical…. …. (the system was installed in June 2010)…. Finally with so little brightness of late outside, any photos have been challenging and they’ve all required a high ISO setting, so poor quality I’m afraid. 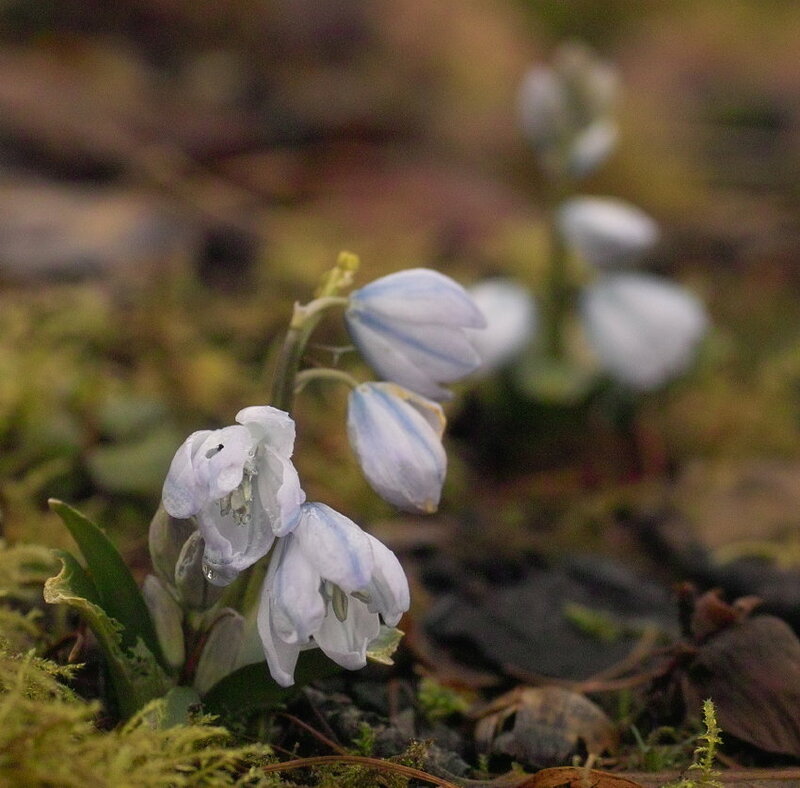 But I can record the first flowers of Scilla tubergeniana, or S. mischtschenkoana, which reliably seems to rival some snowdrop cultivars in its earliness. A word of warning though, which the bulb catalogues don’t seem to mention. Our experience of it makes us think its a real delicacy for any early season slugs, so it does need monitoring closely and probably some protection, to avoid serious damage. 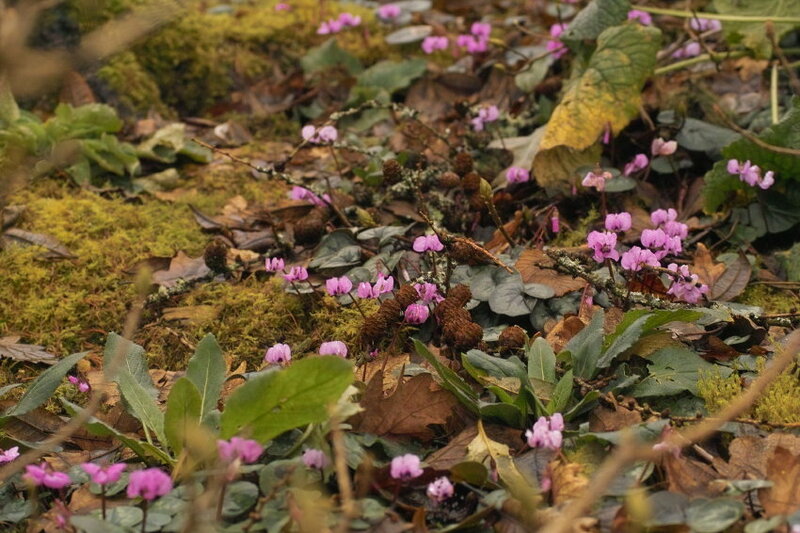 Oh, and a chest soaked, prone photographer to get an image like this, since the emerging flowers are held very close to the ground, though they rise with time to 3 to 4 inches, which is an unusual and pleasing habit. 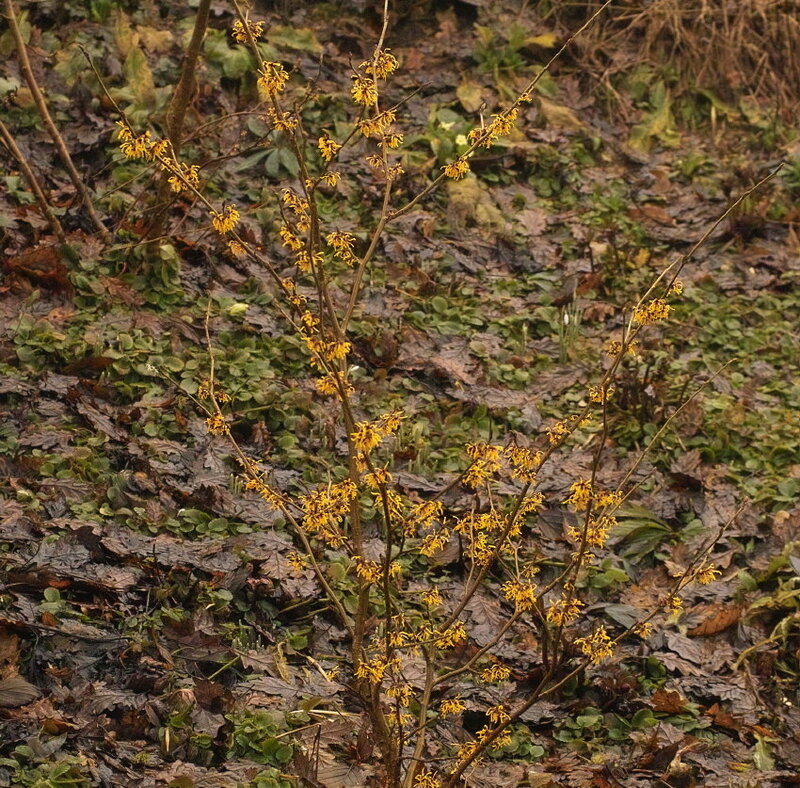 Hamamelis Vesna is now in full bloom, and like most of our Hamamelis has needed a good 4 years to really settle in …. 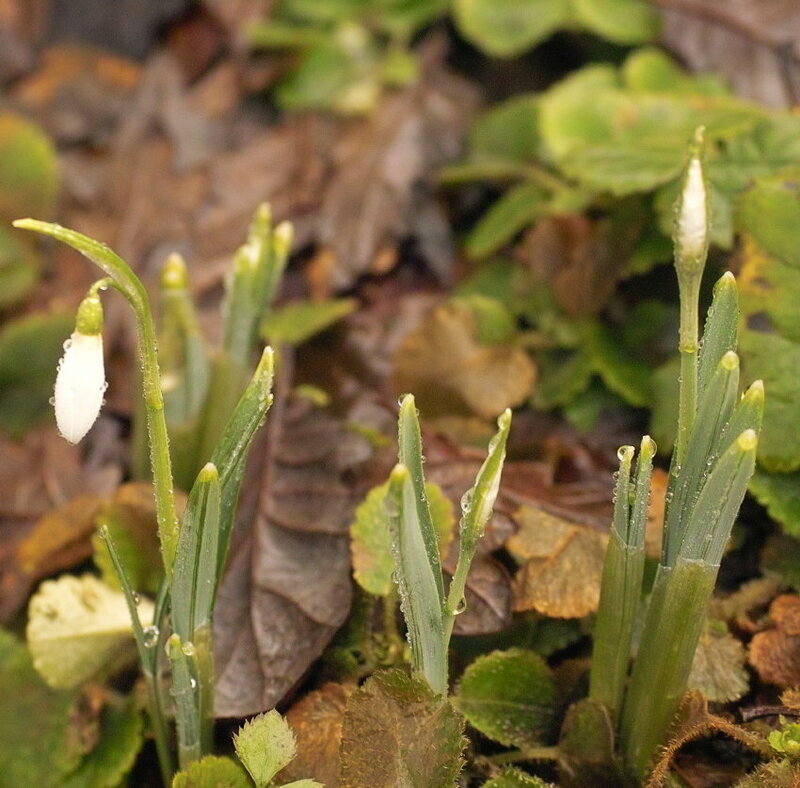 And the first 5 cultivars in our growing Snowdrop parade are now lightening the scene.. Three Ships, Mrs. Macnamara, Bess, Galanthus rhizensis and one of our favourite good doers, Galanthus Atkinsii (below), is just emerging. Although it’s sterile, it still bulks up quickly…. Not enough flowers yet to be really exciting, but a strong hint of the delights to come in February. Meanwhile, in contrast, the Cyclamen coum are on fine form….. Thanks for the comment and the video links, which I look forward to watching when our satellite dish connection isn’t misbehaving – downloading videos is always a bit hit and miss for us up here! 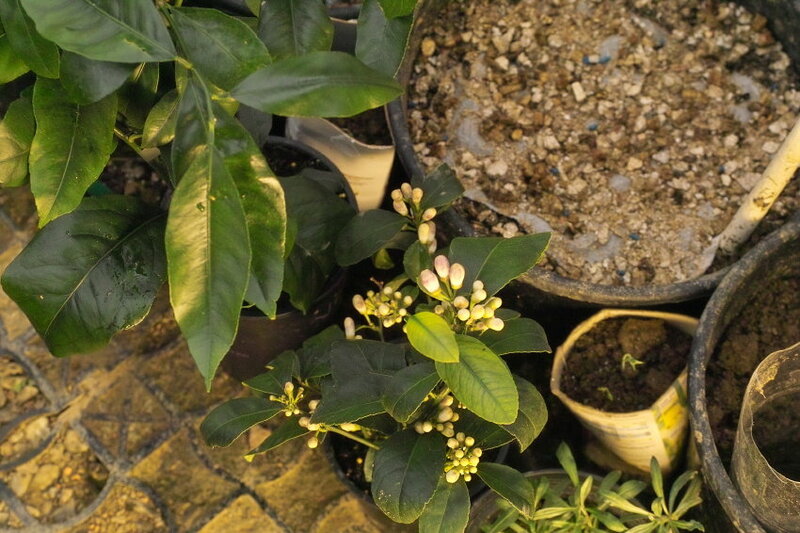 I’m going to do a final piece on how the compost reactor has turned out – both end compost, and the additional heat still being supplied into the greenhouse in what has been the coldest spring for decades in the UK. Overall I’ve been really pleased with how its worked, but would make just a few modifications for next year. With the central heat store path kicking in more with longer day length/higher sun, the overall higher mean 24 hour temperatures are really helping growth.